You can do what I cannot do. BY FIRST BECOMING A SERVANT. She inspired the world to help the sick and the dying. She showed us how to bring dignity to those who had none. She taught us the power of one person... helping another. Her leadership changed millions of lives. MOTHER TERESA (1910-1997) WAS AN ALBANIAN CATHOLIC NUN, born and raised in Macedonia, near Greece. She moved to Ireland to become a missionary and schoolteacher, and then to India, where she lived until her death. 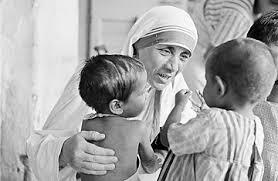 After seeing great poverty and death, Mother Teresa felt called to found the Missionaries of Charity. It was born and lived in struggle. During her first year she had no income and had to beg for food and supplies. Teresa experienced doubt, loneliness and the temptation to return to the comfort of convent life. But Mother Teresa persevered and proved gifted in bringing people together. Her organization grew to more than 4,500 Sisters working in 133 countries who run hospices and homes for people with HIV/AIDS, leprosy and tuberculosis; soup kitchens; dispensaries and mobile clinics; children's and family counseling programs; orphanages; and schools. Members adhere to vows of chastity, poverty, obedience, and free service to the poor. During her lifetime, Mother Teresa was named 18 times as one of the ten women around the world that Americans admired most, finishing first several times. She received many honors, including the 1979 Nobel Peace Prize. Mother Teresa is currently in the process of being recognized as a saint by the Roman Catholic Church.